"Business cards are for business people only"
The above statement is a common misconception. Business cards should be for everyone. Even if you don't own and run your own business you should ensure that you have business cards. Business cards perfectly encapsulate who you are. They are a means by which to convey to a person whom you've just met who you are and what you do. The idea is that they should make a quick summation of the person they have just met or are about to meet. Contrary to the above statement, business cards are not just for business people. You could have business cards for your hobby or your side project. 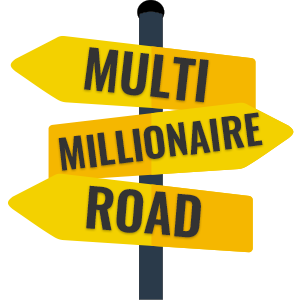 I have business cards for this blog: multimillionaireroad.com. So why do you need business cards. Business cards add a certain level of credibility that cannot be achieved just from meeting someone in person. Let's say you've just met someone in a work environment and you hit it off. You want to swap details with each other. Make sure that you aren't caught out in this situation! Come prepared. There's nothing worse than scribbling a number or email down on a scrappy bit of paper. A business card creates an image of polish and professionalism. Business cards are ideal in a networking environment. They provide the perfect exit cue from a conversation. Let's say you've just met someone at an event and had a great chat. You can excuse yourself from the conversation by handing over your business card and telling them: "it was great to meet you, let's catch-up over coffee sometime." Boom. Done. You're out of the conversation politely and can move on. Please note that the power of business cards in a networking situation should not be abused! Do not go around a networking environment by simply handing out business cards. I've seen people doing this - literally standing at the entrance to a networking event and handing out cards. This is grossly unprofessional. You need to make sure that you actually have a meaningful conversation before exchanging details! I've seen some incredibly impressive and impactful business cards. At my accountancy graduation ceremony in London I met John Goodwin, CFO of Lego. After his presentation I went up to him to ask him for his business card. I really wanted it - it was a little Lego man with his contact details printed on it! I still treasure that business card. You can get really original and unique business cards from a host of different websites. I used vistaprint.com and am happy to recommend them as very reasonably priced and good quality. Get out there and use business cards to get your name out there.